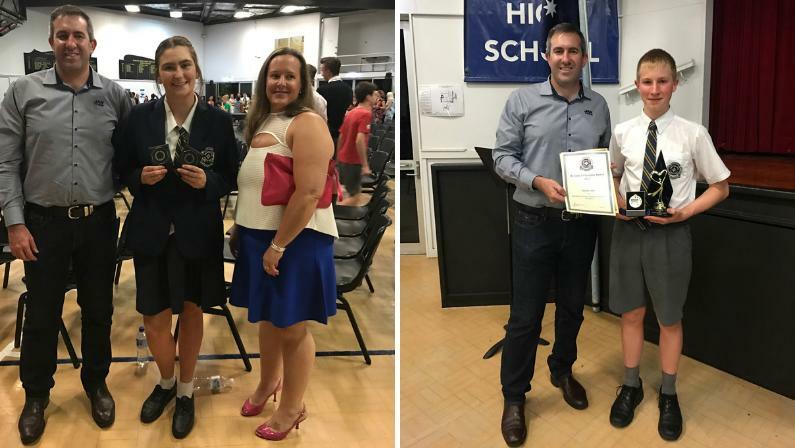 Monday 30th October was the annual awards night at Everton Park State High School. A wonderful evening of celebration and achievement for the students. Special Thanks to Principal Sue Wallace and staff for hosting Kylie Carmody and Dean Weston. As always we were welcomed with the warmth and community feeling that is evident at Everton Park. Not only has Hayley achieved and applied herself throughout her senior schooling and combined VET studies, as the current recipient of The Hills Scholarship Award, Hayley has also been awarded the VET Student of the Year Award. Hayley has now been offered to commence full time work as a result of her hairdressing studies. So, after a quick 1 week holiday when school finishes, Hayley will commence her full time hairdressing position. We wish Hayley the very best as she embraces her new journey ahead. A talented young man, polite and well spoken. As a current year 10 student, Jacob has a bright future ahead of him. Pictured with Dean Weston who presented Jacob with the AJ Cook All-Rounder Award, supported by The Chamber. We had the opportunity to chat with both Jacob and his family, who are clearly proud of Jacob’s achievements.